A symposium, scheduled for March 18 at 1:30 p.m. in the Grand Salon of the University Student Union, will feature nearly 200 posters from the participating LAUSD students. The annual symposium — where CSUN faculty and staff meet students, their parents, and teachers to celebrate the science projects they worked on — is one of Oppenheimer’s favorite parts about the journal program. 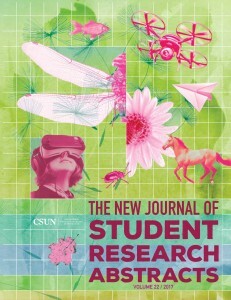 The journal was first published in 1995 as an offshoot of lectures and workshops that CSUN was holding for science teachers for several years prior. The workshops, now known as the journal program, were designed to empower educators and help them come up with creative research materials and ideas for their classrooms to engage students in academic research. This year, the journal won the Oviatt Library Open Access Award presented by library dean Mark Stover. Oppenheimer noted that all 22 volumes of the journal are available online, due to the effort of the library staff. Oppenheimer said he believes the project will eventually have a global impact. The project was recognized at the White House STEM conference and by CSU Chancellor Timothy P. White.